When a boil water advisory is lifted, one must be keen to disinfect any object that was in contact with your tap water. Proper precautionary measures should apply to protect your health and the people around you. A boil water advisory does not always mean there’s contamination, but it is possible that with water pressure or a water main break there will be water contamination. People typically work under the assumption that water is contaminated until sample test results are done by the municipality or water authority are deemed to be clean. No matter what, consumers should continue to boil their water until they hear that the boil water advisory has been lifted. Even if water sample test results show that there is no contamination, residents are advised to disinfect or flush water pipes after the boil water advisory is lifted. Clear household or building water pipes or water lines of potential bacteria for your safety and protection. 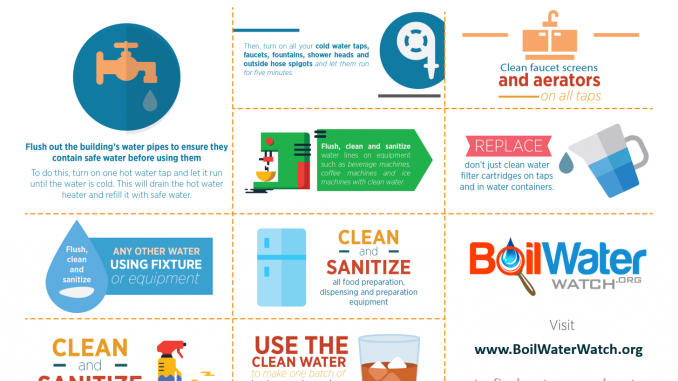 Here are a few important things to remember post boil water advisory. Ice Cube Containers: Empty ice cube containers of ice or water, or automatically discard ice during and after boil water advisory. Restaurants, homes and any establishments making ice cubes must dump the batch of ice within 24 hours, wipe the container with disinfectant and make a new batch of ice cubes thereafter. Cold Water Faucets: Before using the water line for drinking, brushing teeth, making ice cubes, food preparation etc., make sure it is safe to use and clear from any forms of contamination. Turn on the hot water tap and let it run until water becomes cold. You should also open all cold water lines such as faucets, fountains, showers and water taps and run them for five to ten minutes. Hot Water Faucets: Turn all faucets to hot water and let it run to flush pipes for 15 minutes, the bigger the water tank the longer time is needed to flush water tap. Once done, hot water is now safe for use when doing hand washing or dish washing. Dish Washing: As soon as water lines have been flushed, hot water pipes can now be used on the dishwasher. Remember to empty dishwater before using. Food Preparation: Get rid of foods washed or prepared with water before and during the boil water advisory. Disinfect cooking pots and any cooking items before using them. Coffee Makers, Food Dispensers and Beverage Machines: Flush equipment like food dispensers and beverage machines with clean water and follow the instruction manual on how to disinfect or clean the machine. Water Treatment Device: Replace water filters, water cartridges, faucet screens and aerators on all taps used as water treatment and filtration devices. When in doubt, it is always best to clean, sanitize and disinfect any of these devices before using water again. Private Water System: If you are using a private water system, contact any of the public water safety officers working in your area to test the water system and check all water pipes. Expect that there may be a lack of water pressure, as well as discolored water, after boil water advisory is lifted. This is normal and will not cause any health risks. Most nearby residents will be flushing their lines and disinfecting their equipment, so these side effects are common.